Kids will love Kwa Maritane as there's just so much to keep them happy and occupied - from 2 swimming pools (including one with a fun slide! ), trampolines, tennis courts, bush putt putt and even a climbing wall! famous for its waterhole hide linked to the lodge by a 180m long underground tunnel – enjoy a front row seat literally metres from the animals as they come down to drink at the waterhole! Kwa Maritane, means ‘Place of the Rock’ – pretty appropriate given that it’s located on the outer rim of an extinct volcano overlooking a unique granite dome. 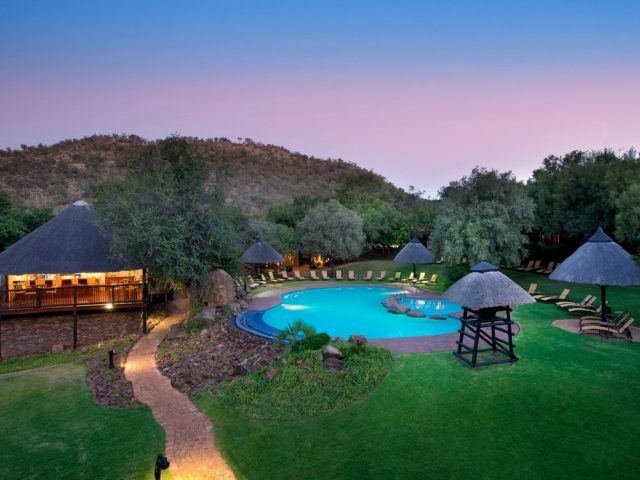 The original tourist development inside the Pilanesberg National Park, this resort-style property makes for a perfect family-friendly bush experience. For one thing it’s situated just a easy couple of hours drive from Gauteng (so you’re likely to be spared the worst of those “are we there yet?” whinging from the back seat that we all dread!) There’s also a host of different facilities and activities on offer which will keep the whole family happy. The lodge is famous for its waterhole hide linked to the lodge by a 180m long underground tunnel – here you can relax and enjoy a front row seat literally metres from the animals as they come down to drink at the waterhole. There’s also a permanent webcam set up, so if you’re feeling too lazy to take the walk down the tunnel, you can relax on your bed and watch the feed on the dedicated TV channel! 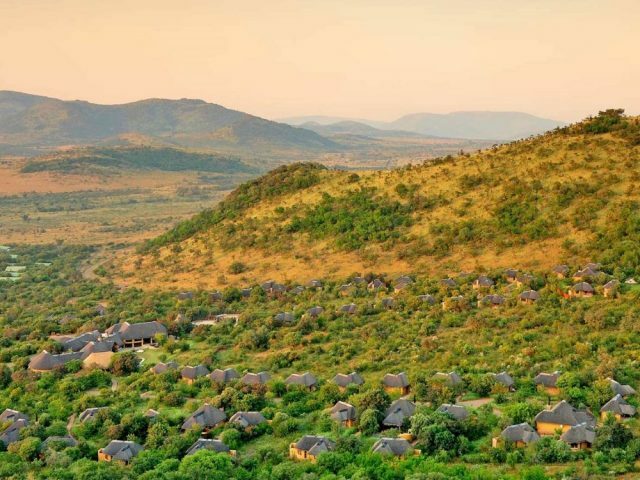 Located in the south of the 55 000 hectare, malaria-free Pilanesberg National Park, Kwa Maritane makes a great base from which to enjoy the rich diversity of indigenous flora and fauna on offer here - including the Big Five. You can pop out in your own vehicle of course given that the reserve’s roads are open to the public, but it makes way more sense to go out on one of the organised lodge game drives led by one of their experienced field guides – they will drive you into the Park in the cool air of the early morning or late afternoon to evening when the animals are more active and hopefully out and about, to ensure that you won't be disappointed. The Pilanesberg is in the transition zone between the dry Kalahari and the wetter lowveld bushveld zones, so there is a stunning diversity of fauna and flora on offer here, including the Big Five, rare species like brown hyena, sable antelope and black rhino – not to mention over 350 bird species! Back at the lodge itself you can be as active or lazy as you want. Kids will delight in the 2 swimming pools and children’s playground, whilst some of the other activities on offer include a rock climbing wall, tennis courts, pool table, table tennis and even bush putt putt – there’s also a Junior Rangers programme if they are keen to learn more about the wonders of the bush. Whilst the kids are charging around, why not head off to the Spa where you can be pampered in one of 4 treatment rooms. Of course, the varied attractions of Sun City are also just a 10 minute drive away. Like sister resort Bakubung, Kwa Maritane consists of both a timeshare section (which we don’t book) as well as 90 hotel rooms of various types. 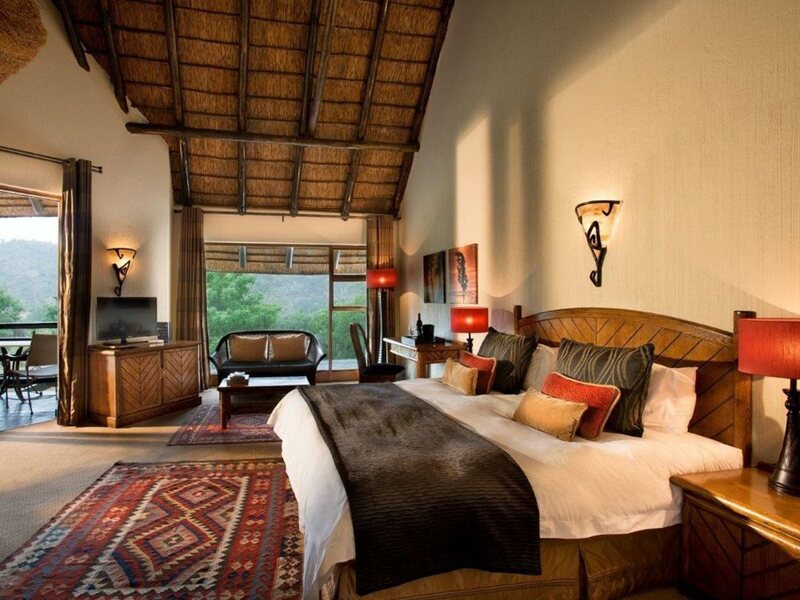 Unlike smaller traditional game lodges with their standalone chalets, the rooms here are located in larger blocks but they are pleasant and well-appointed but obviously more “resorty” than your typical small game lodge. Again they are also really family-friendly – for example each Studio Twin Room has two double beds and a sleeper couch and to ensure your comfort and convenience they have air conditioning, bathrooms with shower and toilet, DStv, direct-dialing telephones, electric shaving plugs, coffee and tea-making facilities, a hairdryer, international multi-plugs and electronic safes. As you would expect in a resort-style lodge, most of the dining in the main restaurant consists of large buffet style meals (useful with fussy kids especially!) 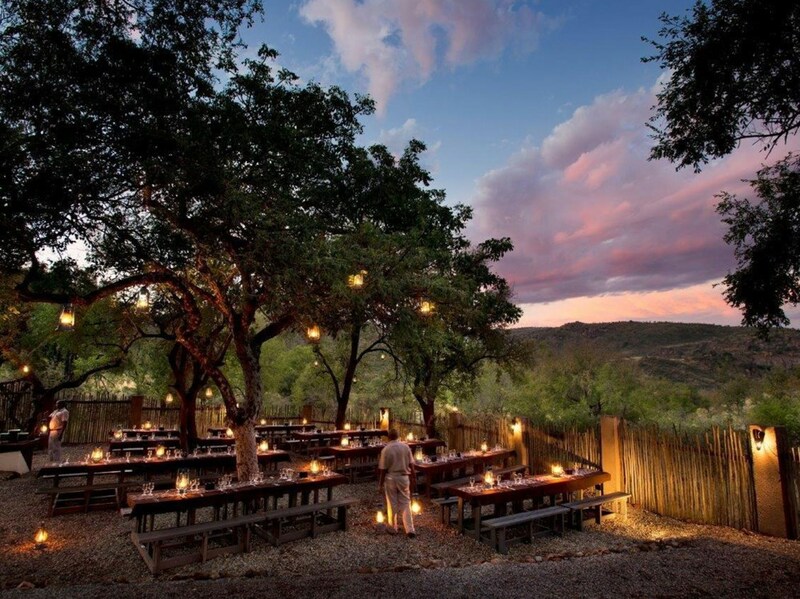 but a couple of times a week there are also bush boma braais where you can enjoy eating under the stars. 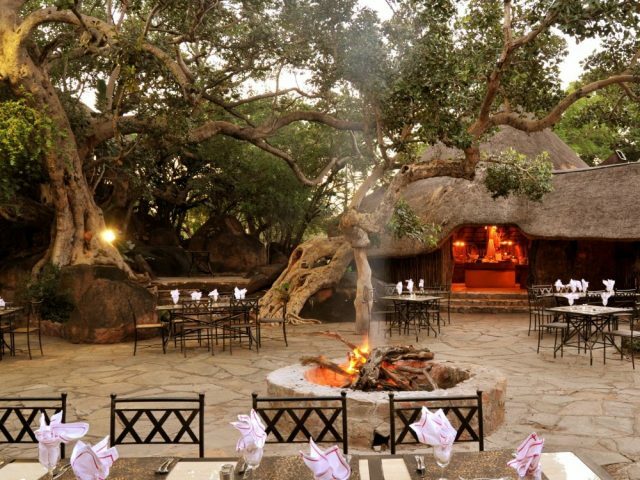 A favourite spot is on the restaurant terrace overlooking a small waterhole where you may be lucky enough to eat your breakfast with animals drinking nearby. Talking of drinking, for more adult time head to the bar for an ice-cold beer or cocktail and perhaps catch the game on TV.